Yay! 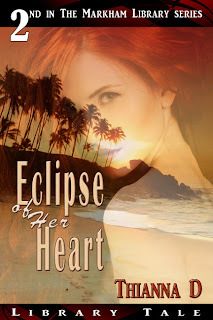 Today is launch day for Eclipse of Her Heart. Are you excited? I am. Love this story. Technically I started writing it before the 1st Markham Library tale, Through the Library Door, but that story took over for a little while. But finally, Seri and Joshuan’s story will be told. Then read part II here. Tall light gray stone walls with large imposing paintings of figures who glared down upon them. It felt as though they stood in the middle of a corridor as a long hallway went in each direction. Against the wall opposite them stood two knights made of metal. They stood, one to each side, of a wide staircase that led to the second floor. The flight to the third floor was much thinner. 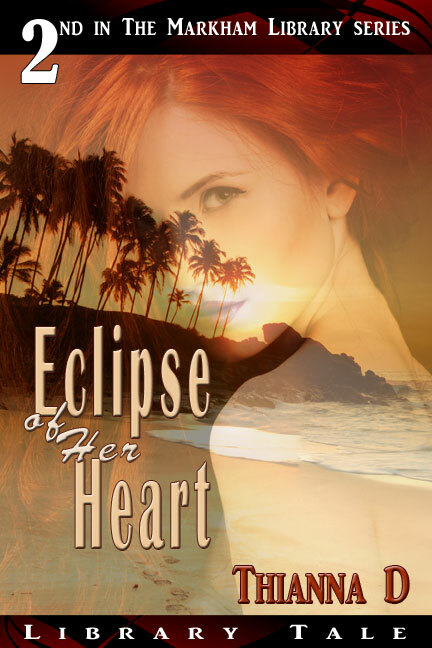 It was barely three times the width of Seri’s shoulders and after the width of the first staircase and the passage she had just walked down, she felt converged upon as she walked up behind Jennifer. Once they reached the third floor, though, she was pleasantly surprised at its appearance. While the first two floors appeared stuffy and old, this one was warm and inviting. The walls were painted a soft mauve and a plush tan carpet was on the floor. “With this being where we live, I insisted we be able to change some things up here.” Jennifer winked. She led Seri down a long wide corridor with windows on one side looking out on the grass and the trees beyond and doorways on the other. Jennifer rattled things off as they passed each door. As each door looked the same as the one before it, Seri wondered how she could tell. “Guest room…craft room…Geoffrey’s study…Geoffrey’s bedroom…“Peter’s and my bedroom…and here we go,” she said as she came to the second to last door. Opening it, she waved Seri in before her. Excitement zipped through her, and Seri nodded quickly. She could hardly wait to get her hands on the books. As Jennifer left and she kicked off her shoes and socks and climbed onto the wonderfully comfortable bed, she wondered if she would be able to bring any of the books to her room to read. Some books should be read in bed, she mused to herself as Marka appeared with a tray filled with juice, water, cookies and tiny sandwiches cut into triangles. “Thank you,” she smiled and Marka nodded, curtsied and left quickly. After munching on the cookies, which she loved, and a cucumber sandwich, which she hated, she was too restless to just wait, so she checked out her bedroom. First, she went to the window to see what her vista would be. Considering the view out of the other windows, she hadn’t expected much. She was pleasantly surprised when outside her window, she saw an elaborate hedge maze just beyond the grass.